Just like white, black works with almost everything. Today's sportcoat is the cousin to yesterday's camel hair coat. Same JoS A. Bank, same camel hair, same Ebay purchase, different color. The dress shirt is a pinpoint oxford off white (ecru?) straight collar from Paul Fredrick. All my shirts are from Paul Fredrick so I guess I could quit mentioning it and save some typing. 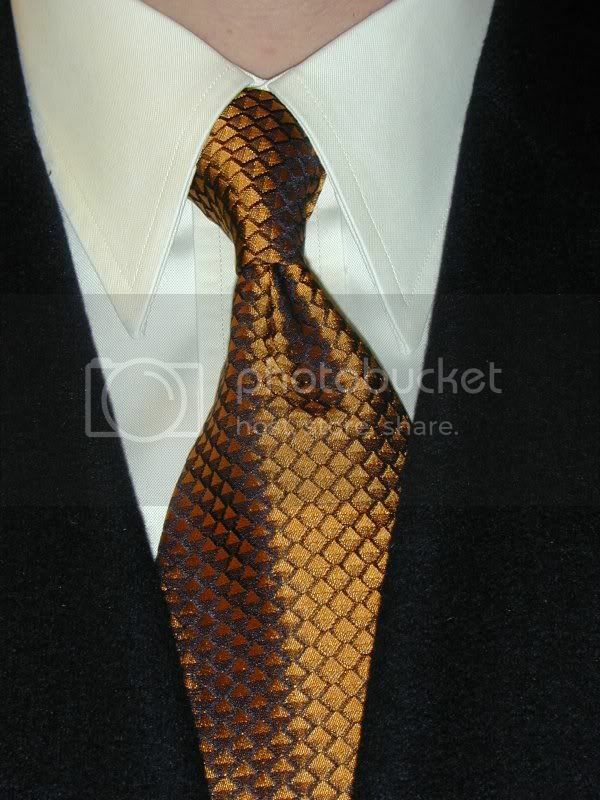 The necktie is a Robert Talbott Studio with a black background and goldish/copper diamonds on it knotted once again in a four-in-hand. Ebay strikes again. Talbotts are some of my favorite ties but there's probably no way I'd purchase one brand new. They run about $80 for the Studio line and about $115 for Best of Class. Talbott also makes some Seven Fold ties the fetch roughly $225! If you don't know what a seven fold tie is then you should do a little search on the 'net. You'll find out soon enough why they're so expensive.